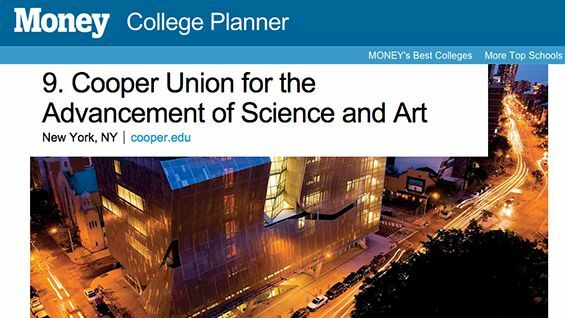 Cooper in Top Ten of Money Mag's 2015 "Best Colleges"
The Cooper Union has been named as one the top ten Best Colleges by Money magazine. The list ranks U.S. colleges and universities by best value, based on quality of education, cost of attendance and expected income after graduation. It is the second year for the annual list and the second time The Cooper Union has been included in the top ten. The ranking methodology utilizes the average price Cooper families paid, net of tuition, last year—the first year in which Cooper’s revised financial aid policies were in effect. "Even so, CU remains one of the lowest-cost private elite colleges around, with an estimated average net price of a degree that is not that much higher than in-state students pay at many top public schools," the Money editors write. The rankings also put substantial weight on affordability for families earning $48,000 or less, a segment that fares better under Cooper’s revised need-based aid policy and which has grown as a proportion of each of the two classes admitted since the change. The methodology used three equally weighted categories -- quality of education, affordability and outcomes -- each determined by several factors. The data points were turned into a single score used to rank the institutions. The Washington Post lauds the Money list as unique among several such college rankings because it, "finally get[s] it right for students," noting that, "Money tries to crack the code on answering the ROI [Return on Investment] question, and of all the rankings out there, comes the closest."